These photos were forwarded to me by mds725 over at the Ukulele Underground. They were taken between 1936-37. 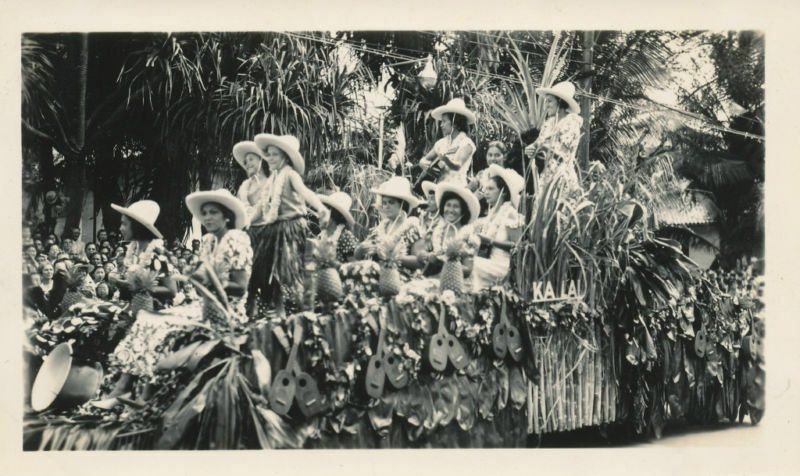 The float here is covered in Kalai Pineapple Ukuleles. Thanks for the photos Mark!!! This entry was posted on July 29, 2011 at 10:20 pm and is filed under Photos. You can follow any responses to this entry through the RSS 2.0 feed. You can leave a response, or trackback from your own site. Wonderful historic photos, but those are actually Kalai, not Kamaka pineapples. Sam Sr. let Kalai use the pineapple decak on their ukuleles. Dates sound about right because in the 40’s, Kalai changed their name to Kalae to make it sound more Hawaiian. This information is from Fred Kamaka, Sr. I was wondering if that is what they were. But I couldn’t see the headstock very well. Thanks again for your input!! !